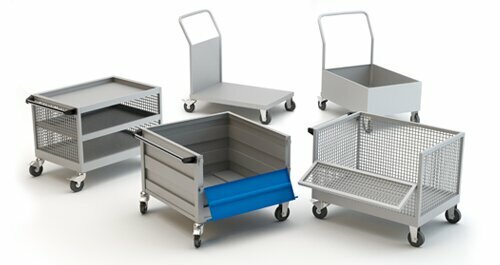 Maxstor provides great variants of material trolley such as platform trolley, service trolley and wire mesh trolley. Material trolley is for general application which is widely use in all the industry such as automobile, electrical, mechanical, food stores etc. Platform trolley has platform made from heavy duty steel structure and reinforced with stiffeners. Platform trolley also have guides to stop material to spill out. Service trolley and wire mesh trolley has 2 to 3 adjustable shelf which has benefits to place more items. Most used items can be kept on top shelf during working at standing height. Maxstor has renowned name in material trolley manufacturer, supplier and exporter in India. Material trolley are also name as Platform trolley, service trolley, wire mesh trolley and industrial material trolley. Robust and Sturdy steel welded construction. Wide range of combination options available. Load capacity up to 200 kg UDL. Centralized locking arrangement with 3 keys. Heavy-duty base for tough operational and heavy load carrying capacity. 100mm diameter wheels 2 revolving with brakes and 2 fix.